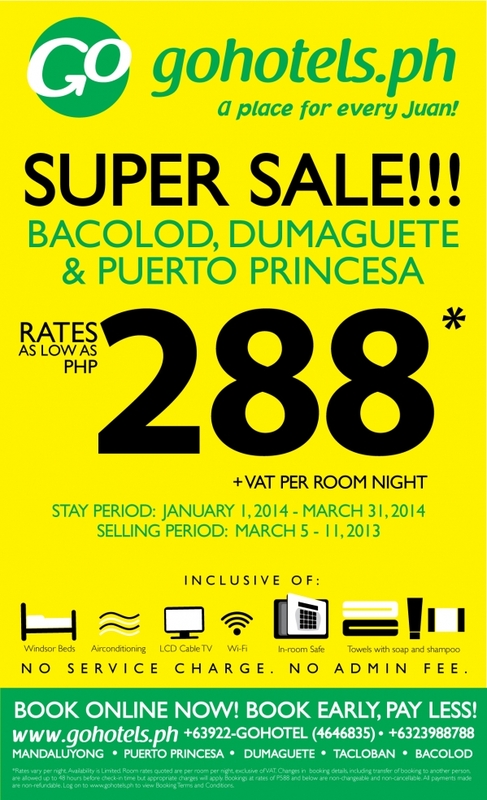 The promo is valid for the stay period of January 1 to March 31, 2014. So, if you have plans to go to any of the above destinations, makes sure to book now. You can get your tickets are www.gohotels.com.ph. 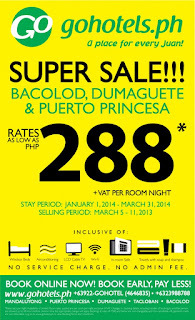 The promo room rates are available until March 11, 2013 or until they are all sold out. Go Hotels is a leading provider of cheap hotel room and services and has branches in Mandaluyong, Bacolod, Dumaguete, Puerto Princesa and Tacloban. Robinsons Land Corporation (RLC) operates Go Hotels. RLC in turn is under the JG Summit Holdings Inc (JGS), the parent company of Cebu Pacific airline. Promo Philippines is a local blog focusing on aggregating promo announcements from various establishments in the Philippines including but not limited to airlines, hotels, malls, and online stores.